Many people are asking questions about the Berean Free Seventh Day Adventist Church. 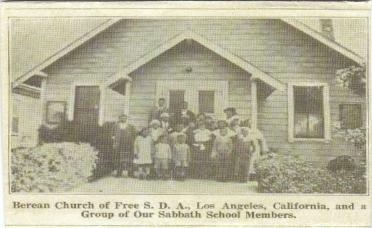 The Berean Free Seventh Day Adventist Church became incorporated December 21, 1916. During this time L.C. 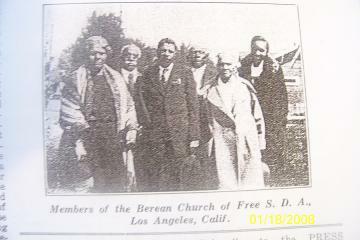 Sheafe was the chairman , C. Lillian Lattimore was the secretary, and C. Anderson was one of the Board Members. Work of Free S.D.A. in Los Angeles, California. Elder Mosley’s visit— On the beautiful morn of January 29, 1931, after three days’ tiresome journey on the train, I arrived at Los Angeles, California. Bro. E. Beckham was at the station of the Southern Pacific line patiently awaiting my arrival, who afterwards conveyed me to his home, where I made my temporary abode. Bro. C. Anderson (who has volunteered to hold the work together till the minister gets here) was elected local elder of the church. Question: Is the Berean Free Seventh Day Adventists/International Association of Free Seventh-Day Adventist Church in Norcross, Georgia(U.S.A.) a part of the sister-hood of churches and ministries that are associated with the General Assembly of Free Seventh-Day Adventists? Answer: No, it is not. For further information please contact us, and request the DVD on more History. This information will prayerfully answer all your questions and concerns.